Lexol 8oz Care Kit Box Includes: 8oz Lexol Leather Cleaner, 8oz Leather Conditioner, and two Lexol Applicator Sponges. Deep-cleans and foams away dirt and oils that build up on leather articles. For best results, follow cleaning with light application of Lexol Leather Conditioner while leather is still damp. Unique Formula penetrates easily into wet or dry leather. Bonds with fibers. Used for tack, saddlery, harness, leather boots, shoes, belts, coats, jackets, gloves, caps, gun case, camera case, outdoor equipment, and luggage. Lexol Conditioner leaves no greasy residue and it contains no harmful silicon ingredients which dry out leather over time. 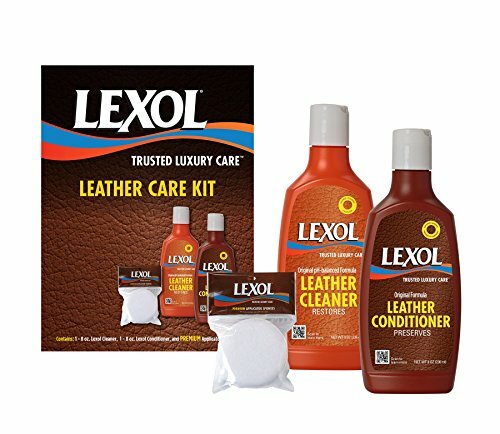 Lexol Conditioner results in supple, strong, and beautiful leather. Pack of 2 non-abrasive, Microfiber applicator sponges that are safe to use without damaging surfaces.